It’s a year of firsts for the Bush Bands Bash: for the first time there is an all-female band (above) and a band from saltwater country (till now the focus has been on desert music). As well, five of the six bands in the line-up are joining the program for the first time. The venue for the concert, in its 13th year, is also changing, from Snow Kenna Park in the centre of town to the Telegraph Station. The all-female band, Kardajala Kirr-Darra (Sandhill Women), hails from the Stuart Highway town of Elliot. Eleanor Nalyiri Dixon and the Mudburra women with producer Beatrice Lewis will take the audience on musical story-telling journey, written by Eleanor, about a woman walking in two worlds. It is sung in Mudburra and English and spans times from ancient to the present. The work grew out of Barkly Shire Council’s national award winning ‘Desert Cultures’ program. 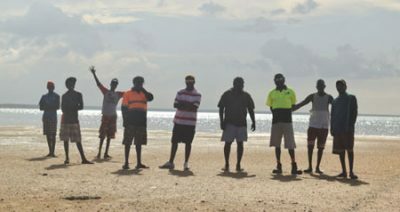 The 10 members of the Salt Lake Band (right) come from Umbakumba on Groote Eylandt. They’ve been around in their country for18 years ago, telling stories to their young ones and turning those stories into music. They play music to keep their traditions and culture alive. They too sing in a mix of English and their Indigenous language, Anindilyakwa, tying them to their song lines, totems and beginning of time. 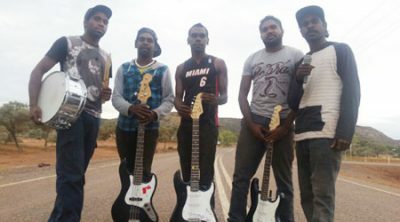 Santa Teresa is home for the Eastern Arrernte Band (below), whose members are all in their teens and early twenties. They are being mentored by the Eastern Reggae Band, old hands at the Bush Bands Bash. The themes for their songs are place, country, family and nature, and rendered bilingually, in English and Eastern Arrernte. Other bands in the line-up are the Lander River Band (from Willowra), the Irrunytju Band (from the Irrunytju in the NPY Lands) and Iwantja Sunset Reggae (Indulkana, also in the Lands). Before taking to the stage at the Telegraph Station on August 28, all of the selected bands will take part in an intensive skills development camp, known as Bush Bands Business. Great to see the Kardjala Kirr-Darra aka Sandhill Women building on the success of the Kulumindini Band’s YOU’RE NOT USELESS, an album which I produced in 1993 with the Elliot men under the leadership of Mr Raymond with Mr Dixon, Ms Dixon Mr Sandi and Mr Jackson. That recording, in Jingili / Mudpurra and English was produced in the Gold Coast hinterland with sax and keyboard session players and is surely due for re-release, perhaps by CAAMA Music? It became a classic on the Barkly, rivalling Tennant’s Barkly Drifters. Inma juju – let’s dance!